Making your home more attractive to potential home buyers is a key element of getting the most value for your home — and getting it off the market quickly. Whether you moved in a few years or a few decades ago, chances are that your home could use some updating before you put it up for sale. A brand new kitchen and master bathroom will make your home shine, but Realtors Joseph Chiera and Robert Page advise that you don’t have to spend $20,000 on a kitchen remodel to get the most for your money. Everyone knows the Golden Rule, says Denise Baron, Philadelphia Realtor: bathrooms and kitchens add value. It’s not always the deck, pond, or floor in the basement. But while a new kitchen or bath can transform your home and its value, not every home seller has the time or budget to take on a major renovation before putting up a home for sale. And of course, not every renovation is a smart move for every home. “I determine where the neighborhood is located, their price point, the value, and how much the house is worth in the present condition versus putting in XY and Z,” says Baron. A renovation that puts your home out of the price range for your neighborhood will be a waste of money, but one that brings your home up to date with others in the area can make your home more attractive — and more valuable to potential buyers. Experts recommend updates like new paint, appliances, and hardware to add quick, inexpensive appeal to your home prior to putting it up for sale. Consider these renovations when it’s time to put your home on the market. The most important renovation experts suggest for home sales isn’t really a renovation at all. But it’s a can’t miss step that’s important for every seller. Griffin explains that staging is so important because strangely enough, the thing that outdates a home the most is often furnishings and decor. Often, buyers simply can’t see past them to imagine how the home would look with a few updates. Want to make a big impact for almost no money? Grab a can of paint and get to work. “The second greatest impact on home buyers is paint color,” advises Griffin. She suggests painting a fresh, light, neutral color on the walls. Lighting can illuminate your home and make it more appealing. That’s why experts say updating lighting is one of the best ways to quickly add value to your home before putting it on the market. “Lighting is one of the most important aspects to address in a home,” says Decor Aid co founder Sean Juneja. Juneja recommends fresh, clean lighting to warm up the space, warning against LEDs or fluorescents which can cast a harsh or yellow light. A combination of overhead, table, floor and sconces are best for keeping your home well lit during the darker times of day and add ambiance as well. “Light dimmers go a long way,” suggests Baron. They’re quick and inexpensive to install, and they can add an element of mood lighting and modernity that many buyers will appreciate. Griffin also suggests new, coordinating light fixtures throughout the entire home. This can give your home a put together designer look that discerning buyers will notice. New cabinets may not be in the cards, but a fresh coat of paint is within reach for practically every seller. Griffin recommends painting cabinets white or off white to attract buyers. Don’t want to paint your cabinets? Consider replacing cabinet fronts with glass doors. Juneja says this is a great update and will bounce light throughout your kitchen. Short of painting, nothing can change the look of your home faster than hardware upgrades, and this project can often be completed in a day or less. Griffin recommends that sellers install new hardware, including door knobs, kitchen cabinet pulls, bathroom vanity pulls, and light switch plates. Available off the shelf at hardware stores, you’ll be able to complete this job with little more than a screwdriver and a few hours of your time. While tubs, showers, and toilets may mostly stay the same over the years, bathroom cabinets can really show their age. Baron suggests replacing cabinets in the bathroom even if a full bathroom renovation doesn’t make sense for your home sale. Pink and green bathroom toilets, bathtubs, sinks, and tiles, are glaring mistakes home buyers will notice. “Unless the buyer is a real estate investor, these colors will deter most buyers,” says Griffin. These fixtures should be replaced before selling any home. If you have old appliances in your kitchen, buyers will notice. And they’ll be doing a mental tally in their head of how much it will cost them to update them when they move in. Remove all doubt and worry by simply updating appliances before you put your home up for sale. Stainless steel or paneled kitchen appliances are much preferred over black or white appliances, advises Griffin. Another option is to check out Craiglist for used models for a fraction of the price, suggests Gibbons. Like appliances, flooring is another element of homes that often leaves buyers considering how expensive it might be to update the flooring in every room of the house. If you have worn carpet or hard flooring that’s seen better days, it would be smart to refinish or replace what you have before selling your home. But if you’re replacing flooring, be careful that you’re investing in a smart choice for your home sale. “I see homeowners have inexpensive carpeting installed when they want to sell their home, but home buyers are savvy enough to know cheap carpeting when they see it,” warns John DeWees, owner of Denver Carpet and Flooring. On the other hand, Realtors know that hardwood flooring sells homes, but hardwood is an expensive upgrade to make when you’re looking to sell. If you have carpet that’s still in good condition, consider a good steam cleaning, suggests Griffin. This will remove spots and odors that can turn off potential buyers. You’ve certainly heard that curb appeal sells homes — and that’s because it’s true. Now more than ever, as buyers are scrolling past listings, what makes them interested in finding out more is often the curb appeal presented in the main listing photo. Courage warns that people will make assumptions on a home just by driving by. If the outside is unflattering, dated, and needs repairs, they may drive right by without even stopping to look at the inside. The outside can even bring down the value of a home. 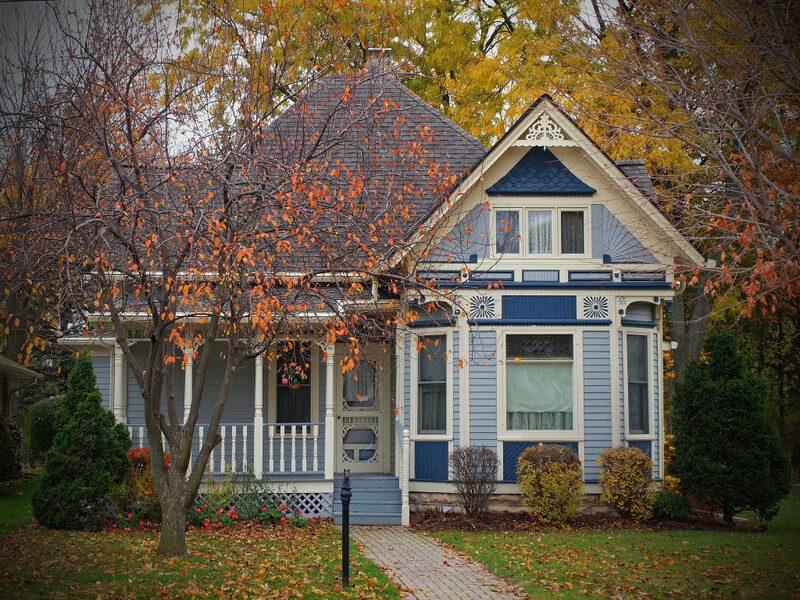 Fortunately, curb appeal is something that can quickly be updated. Chiera and Page suggest that curb appeal is a simple way to renovate your home prior to a sale: “With a few small investments, and some dirty hands and knees, you can make the front of your house pop off the page,” they say. Lighting outdoors is key, as well. Bodrozic recommends installing low voltage lighting. This can add ambiance for dusk and early evenings as well as security for the home that buyers will appreciate. For the front door, Courage recommends a trusted standby: a coat of paint. She says that front doors in good condition can simply be updated with a striking new color. Some trendy door colors include canary yellow, kelly green, and shiny black. Other details Courage recommends updating are worn mailboxes, plugged gutters, broken or dirty windows and trim, and a roof or chimney in disrepair. In good condition, these items suggest a home that’s well taken care of. But if they look like they’ve seen better days, buyers may wonder how well you’ve maintained the rest of your home. Need help planning landscaping or other details for the front of your home? Chiera and Page say it’s a good idea to bring pictures to your local home improvement center and ask for advice. Or, check out design apps Pinterest and Houzz for ideas.